Last Week: Close. Saturday was never windy enough to ride. However, on Sunday from Little Sable Point and north it was windy in the low 20 knots. Today: The wind is working it’s way around this afternoon from SE to S and building from Holland to Muskegon up to around 10 to 15 knots. From Muskegon to the north it will be windier in the 15 to 20 knots or more range. 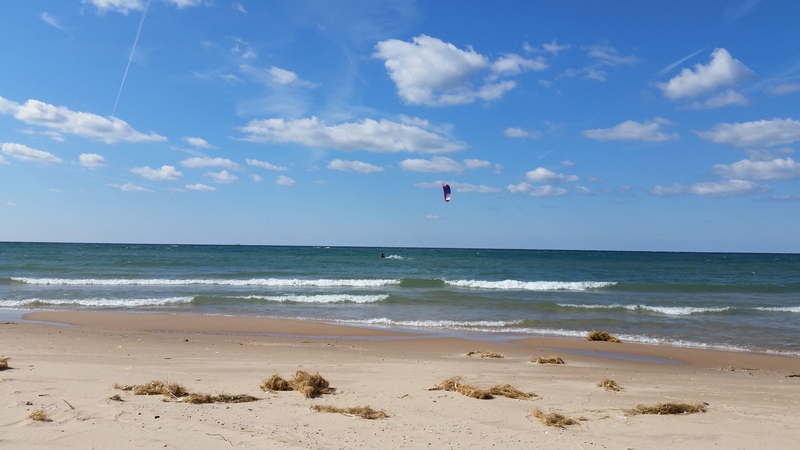 The points of little sable and Point Betsie could be close to 25 knots with clear skies and lots of sun. The wind will lighten in the evening, but then build over night. Saturday: The south wind continues along the coastline becoming more SW as the day goes on. It will be windier from Holland to Grand Haven and to Muskegon in the 20 to 25 knots range then on Friday. North of Muskegon up to Little Sable and up to Pt Betsie will be similar. The wind will become light by evening. The problem possibly with this day is that quite a bit of rain is in the forecast with potential storms. It will be a day to watch the radar closely to look for “windows” to get out and ride. Hopefully it’s not a wash out all day. We could see 4 to 6 foot waves as well. Sunday: A front passes overnight and the wind direction changes to NW overnight. It will be a little light in the morning, but should be good in the afternoon in the 15 to 20 knot range all up and down the lakeshore and then lighten up in the evening again. The rain should also be long gone as well and some sun should be out. It will be more of a fall like day. It’s been awhile since this much wind has been in the forecast for the entire weekend. I’m hoping to get out at least 2 of the 3 days. 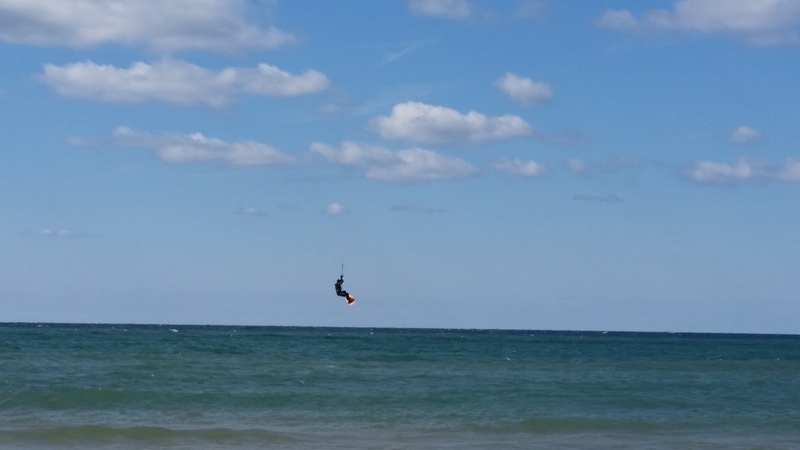 There is also a kiteboarding festival going on at the City Beach in Grand Haven, so that will be a good place to go. Otherwise, the just about any open beach will work. Here are some pictures from Sunday when I got out in Manistee. 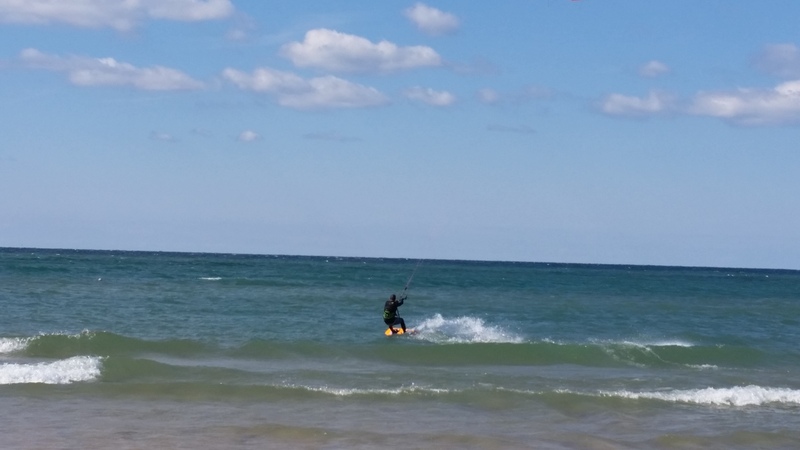 The wind was just SW enough to ride at 5th ave beach at around 20 to 24 knots. There was good flat water next to the pier and some nice waves further down the beach. It was a great day even though the water temperature felt like it had dropped down a lot. Looks like I’ll miss most of the KOGL but may be able to get out Saturday eve and should be there on Sunday.